Chris Packham, BBC presenter of Springwatch and Autumnwatch, ecologist, environmentalist, wildlife photographer extraordinaire has been visiting The Gambia for more than twenty years, and leading guided bird tours for The Gambia Experience for more than ten of those years; no one knows The Gambia’s rich bird life quite like Chris Packham, except for perhaps Malick Suso who is Chris’ ‘go to’ bird guide when he’s in The Gambia and who has an almost preternatural understanding of the birds and their habitats. Together they’re quite a team, and provide hands-on expertise for their guests; after just a few hours in their presence you can palpably feel your own knowledge levels rising. 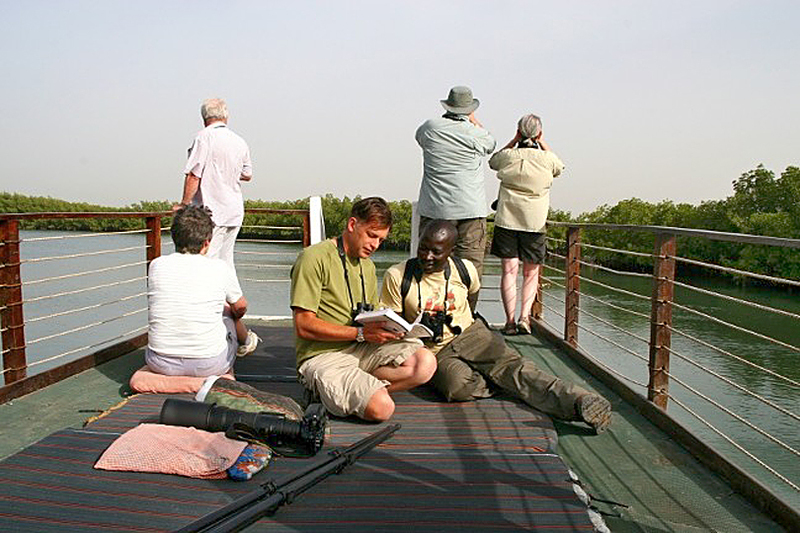 Anyone, from the avid twitcher to those with just a passing interest in birds, will be amazed at the vast array that can be discovered on a holiday to The Gambia – a stroll around your hotel garden with a pair of binoculars will be enough to satisfy many tourists. Even those of you who would not admit to any fascination for birds will not be able to resist the temptation of watching a hornbill perched on a tree above your head, or a Goliath Heron wading across the shoreline. Daily vulture feeding at Senegambia Hotel is also something to consider witnessing, even if you are not staying there. 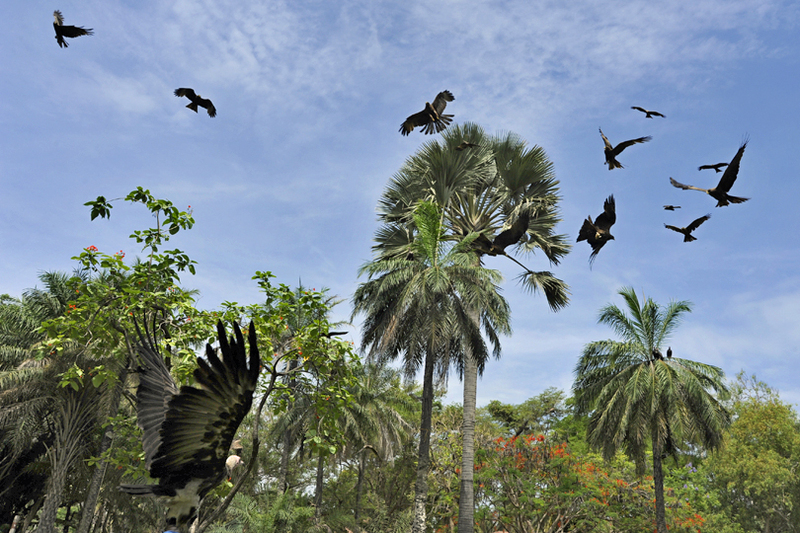 Above: Vultures gathering in the ground of Senegambia Hotel just before their daily feeding time. 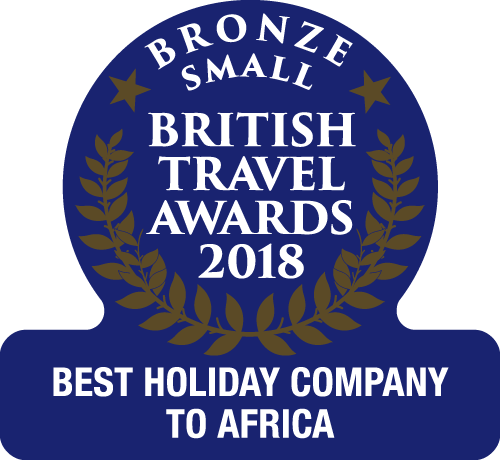 "The Gambia is an ornithological nirvana, with 170 species regularly seen in three leisurely days birding on the coast alone, and 400 more waiting to be discovered further afield. Exotic species such as rollers, kingfishers and bee-eaters are spangled spectacles whilst the dynamic array of raptors are truly impressive. Many others are simply tamer and more easily approached than in the UK so keen photographers always return home with a few ‘trophies’!" Chris Packham. If you’ll allow us to get technical for a moment: The Gambia sits right at the centre of something called a transition zone, which means for a relatively small country it supports a huge variety of habitats, including forest-savannah environments and drier woodland ones, marine systems and, of course, the life-giving River Gambia with its estuary mudflats and the intricate mangrove tributaries of the interior. 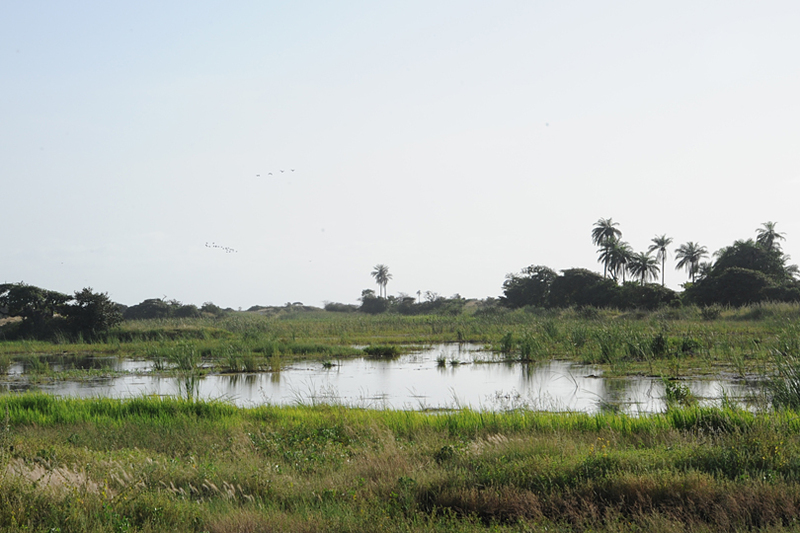 In short, with all these habitats in a relatively small area, The Gambia is one heck of a place for birdlife! Here are a few suggested areas to explore. The River Gambia is a fertile, life-giving source of joy to the people of The Gambia and its tributaries are no different. There is a mythical challenge associated with the bridge over the stream at Kotu, a challenge to anyone who can see 100 species in a single day. It’s been rumoured to have been done at least once, but the mere fact that it’s even a possibility is quite staggering. Expect this area to be busy with bird enthusiasts early in the morning as the birds gather in the relative coolness and tranquility at this time of day. People aside, the pulsing heart of The Gambia is its mighty river. It is the river which provides food and sustenance, the river that provides the fertile lands that ensure Gambians will never grow hungry, and it’s the river – labyrinthine and endlessly divergent – which makes The Gambia many times the size it appears on maps. There is no better way to explore than from the deck of a boat, binoculars in hand as the sun charts its lazy path across the sky. 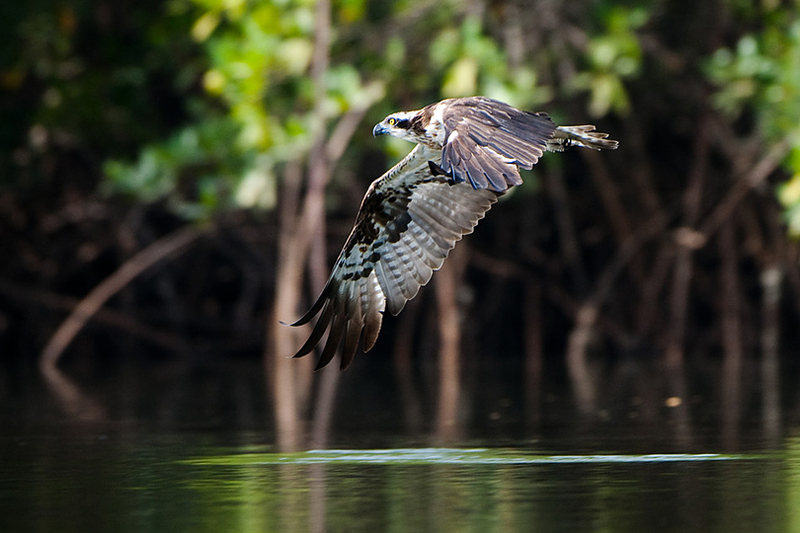 Expect to see herons, Osprey, kingfishers, spoonbills and pelicans – and enjoy the Gambian sunshine at the same time whilst lazily wending your way upstream. A visit to this unspoilt area – off the beaten track and yet within easy reach of resort areas – will provide you with the opportunity to experience both land and water bird species, taking advantage of the expert knowledge of their local guides. It has a special atmosphere of its own and Chris Packham describes it as ‘a little piece of paradise’. 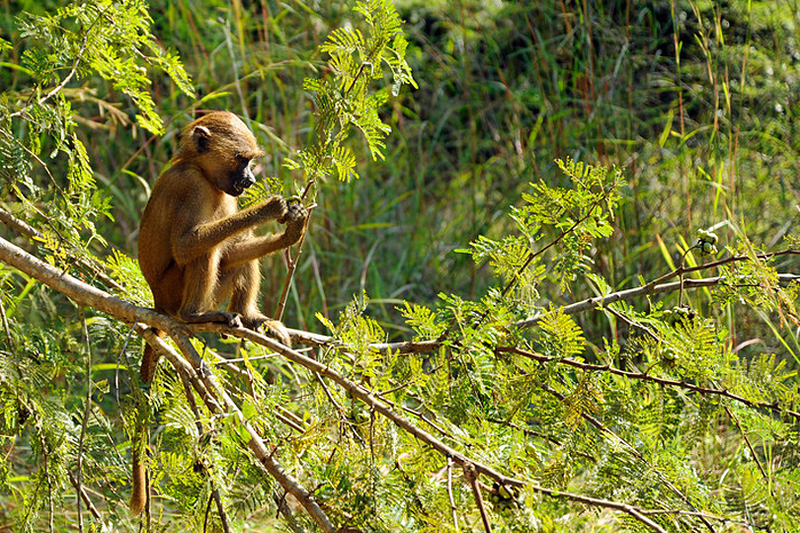 The forest hosts a wealth of other wildlife, such as monkeys, monitor lizards and baboons which you may be lucky enough to encounter. We can think of no better way to spend the cool of the early morning than picking your way through the coastal forest at Tanji and emerging into the hazy light of the shore, watching fisherman cast nets, and different species of tern diving for their breakfast. Over the years the open grassland between forest and the beach has become the favourite haunt of the Golden-tailed Woodpecker – a real rarity and an absolute treat for the eye. You might also be lucky enough to spot a Yellow-fronted Tinkerbird. Kartong Bird Observatory is a non-profit organisation established in 2010 by a group of British bird ringers to study the migration of birds between Europe and West Africa. 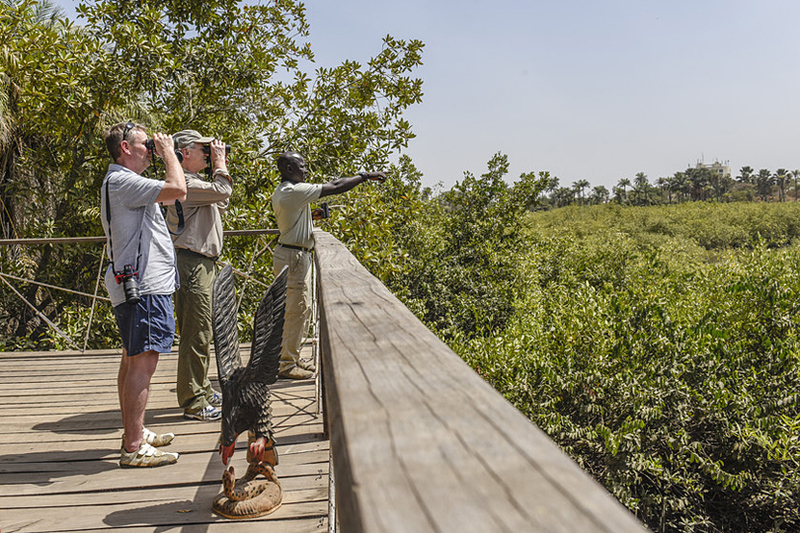 It is located overlooking a former sand mine with areas that fill with water during the rainy season and create one of the prime birding areas along the coast of The Gambia. 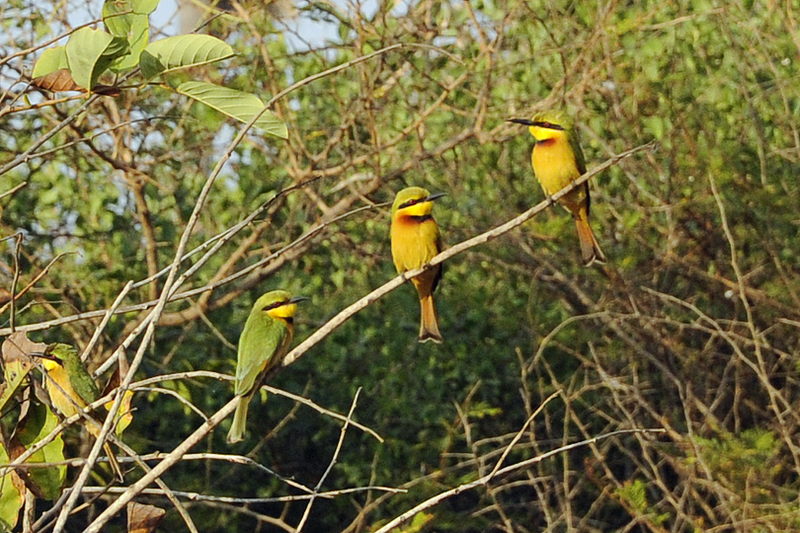 Over 365 species of bird have been recorded at Kartong. The wetlands form the centre of the recording area but other adjacent habitats include, sand dunes, foreshore, tidal mudflats, mangroves, Savannah scrub, rice fields cultivations and a remnant of high forest. If you do fancy spending some time whilst on holiday in search of species to tick off on your wish list, several of the areas described above are visited with Chris Packham on our organised annual tours, others can be experienced as part of a day excursion. Alternatively, why not hire the services of Malick Suso or a local bird guide to maximise your chances of spotting that elusive species – your representative would be happy to arrange this for you. However you choose to explore this amazing country, a pair of binoculars is a must. You’ll find more details here, Birdwatching in The Gambia with Chris Packham. For further information on our Wake up with the Birds, Lazy Day Cruise and Makasutu Forest excursions please visit our Excursions and Experiences page.